Hurricane Michael hit Floridians by surprise. What began as a tropical storm early in the week quickly escalated to a rare category 4 hurricane a few days later. The hurricane wind speed was the 4th most powerful to make landfall in the United States. This left families and shops unable to prepare for damage and even less time to evacuate the area. 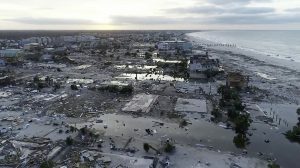 The eye of the storm devastated the Mexico Beach and Panama City, in the panhandle of Florida, an area that has known few storms and never a storm of this magnitude. The cost of the damage is unknown (estimates are upwards of $8 billion), but images and videos show areas totally demolished, roads undrivable, no power, no water, no standing homes or businesses, and completely evacuated. The loss is immense. Floridians have lost their houses, cars, boats, trees, businesses, stores, schools, churches, and even hospitals. It is a catastrophic event. There is no estimate as to when life will return to normal. No anticipated date of returning to the area. No ability to even begin the clean-up due to blocked roads, downed power lines, displaced residences, and lack of equipment. Rescue efforts are still underway. People can’t go home. Schools are closed. Businesses are out of business for now. Shelters are overcrowded. Write it down. For some outside of the inner walls of the storm, the storm did only minor damage while others lost everything including someone they love. The act of putting it down on paper helps to focus on accurate memory while reminding a person that they did live through one of the most devastating storms. Talk to neighbors. This is a time to reach out to neighbors to make sure that they are OK. Many Floridians are elderly, so this is especially important because phone service, power, and water have not been restored in all areas. Shared everyday experiences are far better than trying to handle this alone. Take time to talk to neighbors and form a bond. Be cautious. Already, there are several news stories of unnecessary electrocutions, carbon monoxide poisonings, fires from leaking gas, injuries from power tools, and many car accidents. Even though the work seems overwhelming, go slowly and carefully. Take time to do even the simplest of tasks with full awareness of the environment. Avoid all standing water and downed power lines. Stay present. There is a temptation to relive the past preparations and worry about the future. This can drain precious energy needed for the present day. Instead, try to accomplish only what can be done today and not be anxious about tomorrow. Tomorrow’s worries will be enough for that day. Listen to others. One of the best gifts to offer others is that of listening. Listen to the stories, fears, hopes, and sorrows. Those tempted to advise during this time are doing a disservice to others, most people just want and need to be heard. If they want advice, they will ask for it. For those seeking advice, please DO NOT look for it from a person who has never gone through a hurricane. This is the equivalent of getting parenting advice from a person who has never parented. Begin to grieve. The grieving process for any loss of a person, property, or community is the same. It is denial, anger, bargaining, depression, and acceptance. The duration varies depending on the significance of the loss. For instance, grief over a minor piece of property can take a few weeks, while grieving a community can take years. Expect to ping-pong from one stage to the next in a random order. Release emotions. One of the best ways to release emotional stress is to cry. Crying releases sadness, anger, frustration, anxiety, and stress. Physical activity and meditation are other useful methods to let off some steam. This is not the time to unleash onto family members, the power company, or others trying to help. This only generates hostility and increases isolation. Do normal activities. As soon as possible, try to re-engage in normal routines and activities. Even if the only possibility is a morning shower, it is better to start with something that is even slightly familiar. Try to stick to regular bedtimes and wake times. This allows the body to reset and feel healthy. Eating healthy foods and drinks can also help during this time. The last thing a nervous stomach need is strange foods. The most important thing a person can do now is to give thanks for what they do have instead of what they have lost. While the loss might be catastrophic, it is helpful to discover even the little things that a person can give gratitude for experiencing. Lastly, please stay safe.